At JMI Limousine, we are committed to providing the best limo service Portland has to offer. No matter what the occasion, our classy and talented chauffeurs are read to transport you there in luxury and style. We are proud to be able to provide our customers living in Oregon City with phenomenal limo service. Our limousine fleet is the pride and joy of our business. 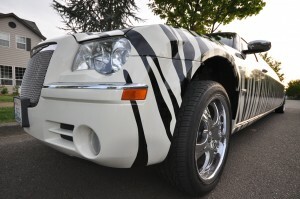 We own a number of luxury limousines, Portland party buses and town cars. With our fleet of quality luxury vehicles, we are capable of providing an array of exciting services. There are countless opportunities for excitement in Oregon. Our chauffeurs can provide limo or party bus transportation for your snowboarding, white-water rafting or water-skiing trips. We can provide transportation for just about any extreme outdoor adventure in Oregon. We also offer an Oregon City prom limo service. Our drivers will transport your child to his/her prom in style, and provide them with an unforgettable experience. We do bachelor and bachelorette parties, weddings, graduations and sporting events as well. Whether you are planning an Oregon City party bus bachelor party, or looking for a limo to speed off in after tying the knot, JMI Limousine is equipped to take care of your luxury transportation needs. You can relax with the knowledge that we will get you where you need to go safely, comfortably and in a timely fashion. Since we started our Portland limo service back in 1994, we have not experienced a single accident. Our safety record is unblemished, and we plan to keep it that way as long as possible. We are vigilant when it comes to maintaining our fleet of Portland limousines and party buses. All of our vehicles must pass regular inspections from certified master mechanics, and are properly insured with both general liability and auto liability insurance coverage. We understand that our drivers represent our company. They are the people who will be driving you around and interacting with you, so we strive to hire the finest drivers that we can find. Our chauffeurs must pass a comprehensive driving skills test, as well as strict background checks in order to be considered for employment. Our charismatic and intelligent drivers are a huge part of what makes our service so special. Our headquarters in Beaverton allows us to conveniently serve customers our customers in Oregon City. It is just a 30 minute drive from central Oregon City to our office, so if you would ever like to check out our fleet or meet our drivers prior to booking our service, you are more than welcome to do so. Contact us by phone or online to request a free quote for our limo service.